April is Grilled Cheese Month and I somehow haven't posted one of these hot, cheese-tastic sandwiches yet. Mea culpa. I'm about to right that wrong, though, and I'm certain you will forgive my delay. In fact, you could even fall at my feet to worship me! This sammie is that good. I was inspired by this awesome pizza from Terra Kelly's book , with its fantastic combination of ingredients. Plus, I had some wonderful wood-smoked pulled pork leftover from when I made Terra's dish—and I had to make sure to put it to good use. I didn't measure my ingredients; just use as much or as little of each as you want (or can fit on the bread!). then add another handful of the cheddar. Place the other piece of bread on top and generously butter or oil the outsides of the sandwich. Put the sandwich in the hot pan and press down with a spatula. Cook about four to five minutes on each side; the bread should be golden and crispy on both sides and the cheese should be completely melted. Now, take a big ol' bite and enjoy! 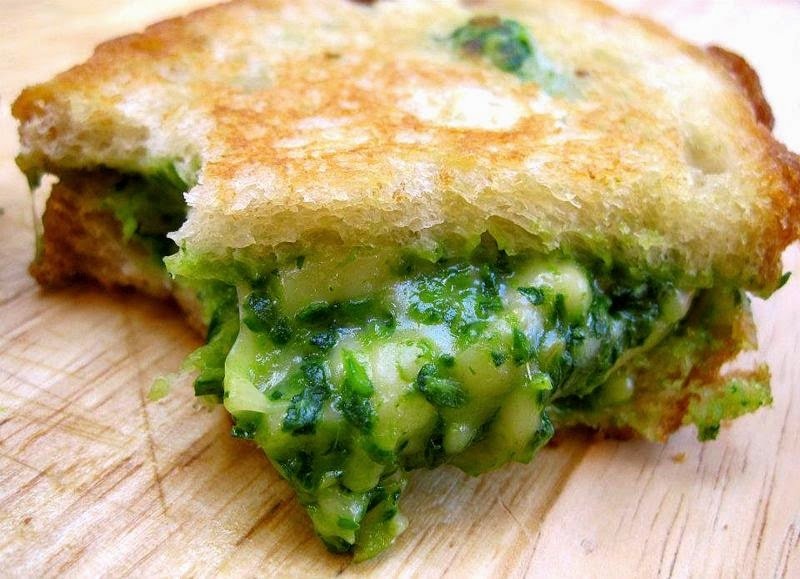 And don't forget to check out our most popular grilled cheese recipe, the Green Grilled Cheese with Spinach, Avocado and Smoked Gouda! Oh wow this sounds great and thank you for sharing this recipe.